Great blue heron soaring upwards. I heard the Heron’s distress call before I saw him. After literally thousands of hours in the field watching the Great Blue Herons, I am susceptible to “trompe l’oeil” moments. I can’t begin to count the number of times I’ve mistaken a twisted tree trunk glinting in the sun for a Heron, or a rock formation that fools my eye from a distance. So, yes, my eyes have been fooled. But my ears? In what seemed a “trompe l’oreille” fool-the-ears experience, the frantic frawhnk, frawhnk of a Heron being flushed erupted from the movie screen, and in the blink of an eye, the Heron burst from the shoreline and fled the approaching boat. 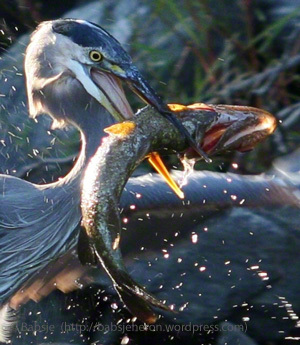 You can hear Great Blue Heron calls at Audubon and also at Cornell’s All About Birds. Thanks to Jen H and WordPress for their recent WPC Challenge: Story. If you like old Bogart movies as much as I do, The Africa Queen spins a delightful story. And more thanks to Cheri and WordPress for the recent Daily Prompt: Frantic. Filmed live on location, the film crew boat flushed the Heron, who burst away with frantic cries. Thanks to Cee for her recent Photo Challenge: Wildlife. Once again, I am very tardy, Cee, but I couldn’t resist. The wildlife in The African Queen is as real as it gets. Not a frame of CGI, all shot on location in Africa. Hippos, fierce crocs, monkeys, lions, and that unexpected Heron. We stood there, staring eye-to-eye for a long, long time, though it could not have been more than twenty seconds. His eyes, doe eyes almost, soft eyes, like those of a deer. His long break, the orange-yellow of Aztec gold. His cap feathers, pure white. It felt as though I was looking at a being of kindness and intelligence, and an equal. And more thanks to Krista S and WordPress for their recent WPC Challenge: Weathered. In the past ten days, we have had three ferocious Nor’Easter storms, with winds up to 65 mph. It is around this time of year when the Great Blue Herons migrate back. I am concerned for them, that they have weathered these storms. I hope to see this Great Blue once again during my inaugural spring circumnavigation of the lake in a few weeks. Thanks to Paula for her Thursday’s Special: Wintry challenge. In defiance of our third fierce Nor’Easter in ten days, I present a placid, summer scene. Thanks to Cee for her recent Photo Challenge: Birds. Once again, I am very tardy, Cee. So, about the title of today’s post? If there were Avian Olympics, surely this Great Blue Heron would take Gold for sticking that landing… Ahem. There are rhythms to the lake, and the creatures there are no less creatures of habit than we humans. The life cycle of the flora in the cove is predictable and, unless the Canada Geese and their goslings have stripped the plants, pickerel weed thrives for weeks each July through August. The vivid purple-blue flower spikes attract beautiful butterflies and bees and other insects. And the Great Blue Herons. You may think the Heron in today’s photo is the same Heron shown here, but you would be mistaken. The location in the cove is the same, but the photos were taken 10 days apart, and the Herons are different, they are are a mated pair. It is fascinating to watch the pair jockey for position on that half-submerged tree: the male lays territorial claim there, and chases the female away. This photo is a variation of two earlier themes of mine: Great Blue Herons with Pickerel Weed and Sticking the Landing and here, too. Thanks to Cheri and WordPress for this week’s WPC Challenge: Sweet. I have spent hundreds and hundreds of hours over decades in that cove watching the Great Blues nibble on insects attracted by that sweet pickerel weed. Thanks also to Ben H and WordPress for their recent WPC Challenge: Variations on a Theme. This photo is a variation of an earlier theme of mine: Great Blue Herons with Pickerel Weed. Click here and here if you don’t remember those photos. Which of the three do you prefer? Thanks to Cheri and WordPress for this week’s WPC Challenge: Sweet. For two days in a row, I witnessed this beautiful Great Blue Heron at the far end of the cove. He preened, and slept, and preened and slept some more, for hours both days. Thanks to Jen H and WordPress for the recent WPC Challenge: Beloved. This is one of the most beloved Herons at the lake.